There is no other way of seeing Andrei Tarkovsky’s diploma film Katok I Skripka (The Steamroller and the Violin, 1960) at VGIK other than as a scratchpad for a would-be master of cinema. As a result, one is only preoccupied with filtering out the Tarkovskian elements of the film from the rest and somehow hammering it to conform to his/her understanding of the director’s oeuvre. However, it must also be acknowledged that the movie is more rewarding if you are indeed familiar with the director’s work. 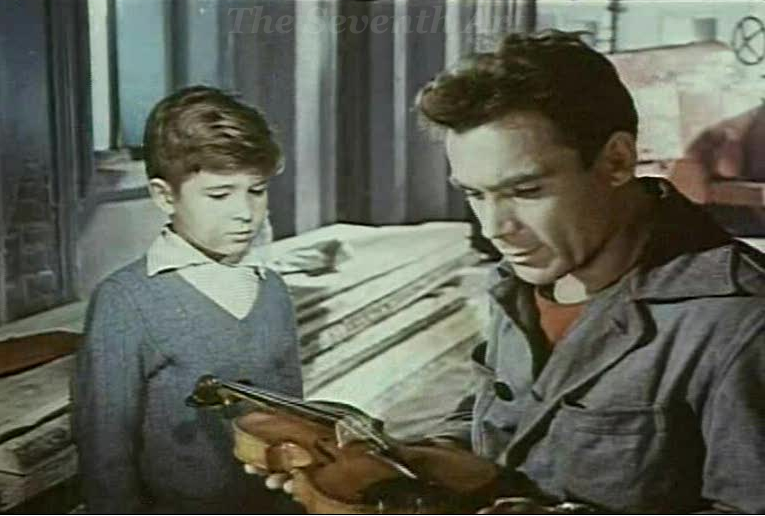 Shot in no less than the prestigious Mosfilm studio, The Steamroller and the Violin is a little gem that is at times prophetic, at times contradictory and at times surprising, when one considers the films of Tarkovsky that were to follow. But one just cannot fail to note the unmistakable signature of the hand that made works such as Ivan’s Childhood (1962) and Andrei Rublev (1966) in this film. The Steamroller and the Violin follows a day in the life of young Sasha (Igor Fomchenko) who learns violin at the local music school. Everyday, he has to sneak past the gang of local bullies that tries to rip him apart. On this fortunate day, he is, however, saved even after being caught by them, by a young worker named Sergei (Vladmir Zamansky), who is working at a construction site nearby. Sasha, then, proceeds towards the music school, stopping once at the window of a curio shop where he witnesses the city through images gathered on the mirrors placed there for sale. After getting berated during a music test for playing the violin according to his imagination and not sticking to the notes provided, Sasha returns to the streets to meet Sergei once more. Following this, Sasha embarks on a little adventure of sorts where he operates the steamroller, roams around the city with Sergei, witnesses an old building being razed down, plays violin for Sergei and even gets into a small fist with a boy bigger than him. Sergei, meanwhile, keeps ignoring a girl who tries to flirt with him. Sergei and Sasha also make plans to go to the movies that evening, but, alas, Sasha’s mother won’t let him go. Despite the romantic nature of its script, The Steamroller and the Violin remains a neo-realist film. But its neo-realism is not of the confrontational kind driven forth dogmatically by the Italian theorists and filmmakers, but of the stylistic one championed by Bazin in his essays. The film’s realism lies in not committing itself to the study of the society (which it never does), but, rather, in the respect it has for the integrity of time and space of its world. Tarkovsky extensively employs deeply focused shots so that large chunks of action can unfold in a single, undivided unit of film. For Tarkovsky, this meant a step away from montage and hence, automatically, from the founding stones laid by film pioneers of his country. 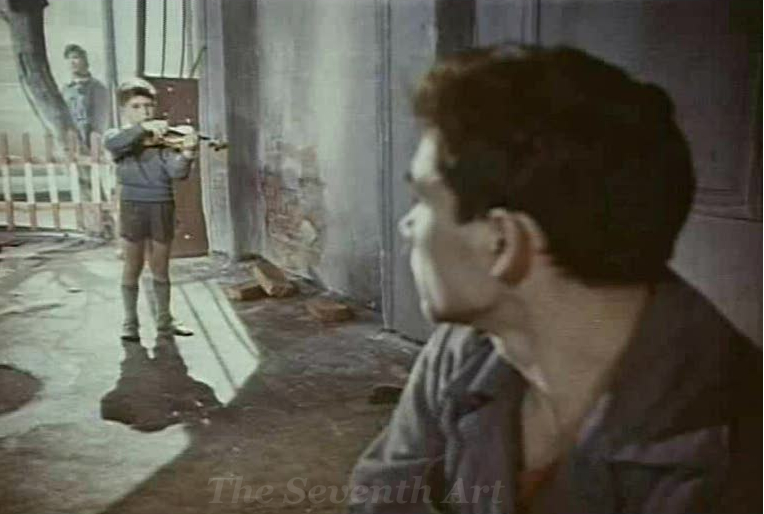 Although, later, he would master the art of non-division of a shot even if it called for Herculean perfection and risk, deep focus proves to be a very viable option for Tarkovsky, here, to let the audience choose key actions of a sequence without having to direct their attention artificially. Furthermore, with this freedom that he gives to his audience, a la Orson Welles, Tarkovsky is able to bathe the film with ambiguity, thus turning upside down both the technique and the intention of the dominant Soviet cinema of yesteryear. I might be giving the impression that the film is far more revolutionary than it actually is, but it is difficult not to applaud Tarkovsky’s ideology of taking art away from political exploitation. His vision couldn’t possibly have crystallized if Stalin, who insisted that art be used only for activist purposes, with no margin for ambiguity in its message, was still ruling the USSR. For Stalin, the artist existed for the worker and never as an independent entity in the society. Everyone had to stick to the positions in the society they were given irrespective of what their choice was. In Tarkovsky’s film, Sasha is conditioned by his teacher to play his violin in the way she wants. His mother prevents him from going to the movie. Instead, he has to stay home to meet some guests (and probably play some classical piece for them). Sasha wants to drive the steamroller, he wants to play the violin like he wants it and he wants to go to the movie whenever he wants. But, unfortunately, he has to assume the role of an artist that he never wants to be. Also, conversely, Sasha will never be able to replace the worker (and vise-versa). Nor will he be able to parry off his bullies like Sergei wants him to. All he can do, and with much satisfaction, is to play the violin for Sergei to make him happy for a few minutes. “I find poetic links, the logic of poetry in cinema, extraordinarily pleasing. They seem to me perfectly appropriate to the potential of cinema as the most truthful and poetic of art forms. Certainly I am more at home with them than with traditional theatrical writing which links images through the linear, rigidly logical development of the plot. Apart from the cinematography, what stands out technically in Tarkovsky’s film is the production design (by Savet Agoyan) which helps Tarkovsky, though being unusual for him, to use a slightly expressionistic mise en scène which should perhaps be deemed academically remarkable. The conservatory and Sasha’s house – the centers of restriction in the film – are allotted dark colours and are populated by rigid, oppressive furniture that seem to choke the frame, Even the cat at the conservatory is black and ominous. The only sign of life at that place seems to be the little girl. On the other hand, the exteriors – where Sasha seems really happy to be – are unusually bright, with vibrant coloured vehicles (The red tractor seems to have become the Soviet symbol of sorts), clear skies and people with cheerfully coloured clothes. The interiors at Sasha’s and at the music school, again, are lit by small isolated beams of sunlight whereas the sun is up and shining whenever Sasha is out with Sergei. Even though Tarkovsky would never again make such cerebral use of his mise en scène (and also a few flashy techniques like the ones utilized during the building-demolition and the final dream scenes), it still remains praiseworthy for a student film – the kind of cinema that almost always retains its jittery and attention-gathering qualities. Perhaps the most striking Tarkovsky trait apparent in The Steamroller and the Violin is the director’s use of water throughout the film. For a very large part, water seems to be present in every frame of the film. Tarkovsky floods the movie with images of water found in one form or the other in everyday life. For him, water wasn’t just a symbol or a token of life, it was life. For Tarkovsky, water’s reflective, meditative, serene, cleansing, cathartic and mystic qualities were nothing short of the magic of life itself. In this movie, however, his use of water, unusually, takes up the job of indicating free life, rather than being present for just what it is. Although one can argue that this strategy is close to becoming symbolism that Tarkovsky would later oppose, it is to be accepted that he has used it very efficiently. Throughout the film, we see water being employed to make a commentary on life in that particular environment. Water is seen flowing smoothly on the streets when Sasha and Sergei bond. The same water is forced and confined into water jugs in the conservatory and at Sasha’s home. 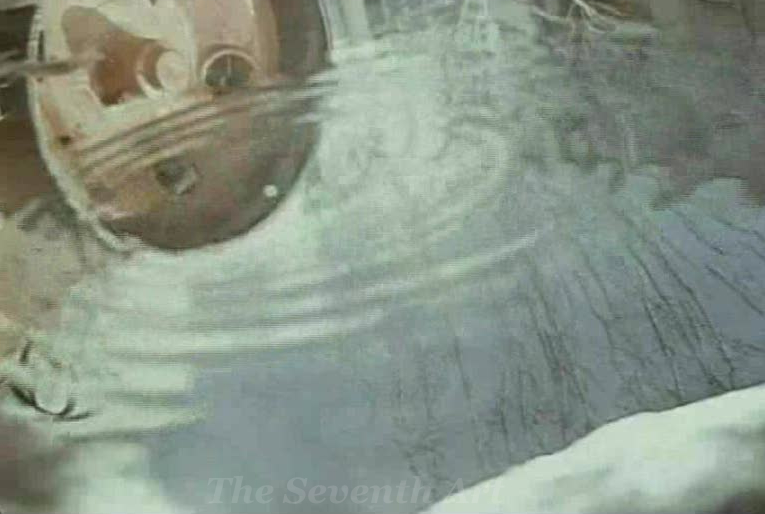 Water appears in the purgative form of a rain during the quintessentially Soviet sequence in the film, where a building is brought down with a soundtrack marked by expressionist music. And water is seen in its softest form in a puddle gently continuing to reflect its surroundings, like it would in the director’s later movies, as Sasha and Sergei descend into a free-flowing small talk. Additionally, there are many images and facets in The Steamroller and the Violin that one would also see in Tarkovsky’s films that were to follow. The basket of apples that the woman in the city drops takes us directly to the cart of apples in Ivan’s Childhood. The contemplative interior where Sergei and Sasha sit for lunch shows up in almost every subsequent Tarkovsky film. The autobiographical aspect of the absence of the father figure and the presence of a strong and demanding mother in the movie is unmistakably Tarkovskian. The question about the role of the artist is a clear precursor to his masterwork Andrei Rublev. Although not blown to full scale, Tarkovsky’s elliptical editing, which would be stretched to the limits later, makes sure that superfluous actions are weeded out and the audience is left with the bare minimum to hold on to and develop into a whole. We see the bullies approach the violin with awe. But it would become our responsibility shortly to understand that these kids never actually wanted to harm the violin, but just to taunt the artist. We see Sasha give an apple to the little girl at the conservatory and that she eats it by the time Sasha leaves, but it is up to us to decide why she was reluctant in the first place. It has been a while since I watched a Tarkovsky film but reading your comments about how he uses water as a motif in this short film reminded me how his cinema is one made up of textures – what is also interesting is how we don’t really consider Tarkovsky to be a political film maker yet the ideological position he takes up is somewhat reactionary. Contemporary Russian film makers including Alexander Sokurov and Andrei Zvyagintsev have been directly influenced by Tarkovskian imagery and their cinema similarly deals with metaphysical question marks. I still consider ‘Ivan’s Childhood’ as one of the great films and perhaps his purest film.